The SmartyAnts Phonics Reading Pup was developed by the founder of LeapFrog and is an educational companion that offers your child a fun, interactive way to learn to read. The cuddly robotic dog comes with a one-month membership to the SmartyAnts Web site, an innovative site that includes a vast variety of stories and games to help children ages four to seven (preschool to first-grade) develop reading skills. Download songs and stories from the site to the puppy, and he will sing phonics-based songs and tell stories that help children practice reading skills. The princess loves us to read to her! We read with her daily, and her love for books only grows as she gets older. So I was excited when we were introduced to the new SmartyAnts Phonics Reading Pup (from the founder of LeapFrog). The Phonics Reading Pup comes with 10 pre-loaded songs, one story, and a membership to the Smarty Ants online world (where you can download new stories and songs to your puppy). We received the White Puppy (pictured above; also available in the Husky Puppy), and upon taking it out of the box, I was pleasantly surprised by the softness! This cuddly little pup is ready to go straight out of the box, so we pressed his paw, and the princess lit up in delight as the pleasant voice sang and the pup moved (very lifelike), she was in complete awe! We later took her online to the SmartyAnt's site where you can download additional stories and songs (very easy) and play in the online SmartyAnts virtual world. The Phonics Reading Pup is perfectly age appropriate, and such a fun reading companion (we strive to make learning fun in our home :); The princess has found a new best buddy! The most interactive, fun, learning toy I've seen this season! Bring home the SmartyAnts Phonics Reading Pup this Holiday season! Inspire little minds with this fun, cuddly, and interactive reading tool! 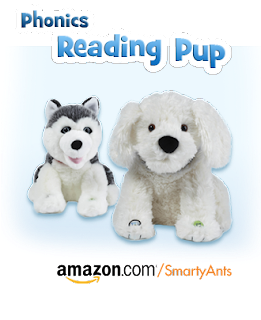 Captivate your little one this Holiday Season with a SmartyAnts Phonics Reading Pup! One Lucky Reader will receive a SmartyAnts Phonics Reading Pup (online membership included)! Leave a comment~Visit http://www.smartyants.com/ and let me know one thing you learned about the online learning program. The comment is considered your entry. Entry to this giveaway ends at 12pm PST December 21, 2010. Winner's are chosen randomly through random.org. The winner will be announced in a post within 7 days of the giveaway ending, and contacted through email. The winner will have 48 hrs. to respond or another winner will be chosen. I learned that this program even exists-I have learned so much going through their website I could not list everything here.